A sandwich refers to the arrangement of all those ingredients between two pieces of bread or a split roll. There are lots and lots of varieties in sandwiches like sub sandwich, club sandwich, burger sandwich, cheesy sandwich and so on. And the filling of sandwich is up to our taste only. We can add chicken, prawns, beef, egg, fish and much more as the main ingredient along with the common ingredients like cheese, veggies, mayo and sauces. 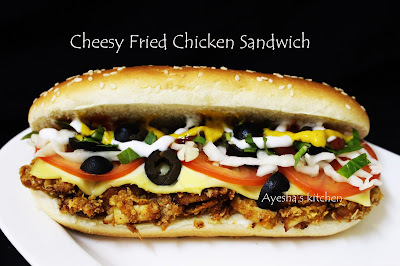 Today lets make a sub sandwich with chicken. Many of us are very busy and in a hurry during office hours. We won't have time to spare even if we are hungry and thirsty. Fresh and tasty sandwich for a handheld meal is a great idea for those people. It is very easy and simple to make a sandwich. 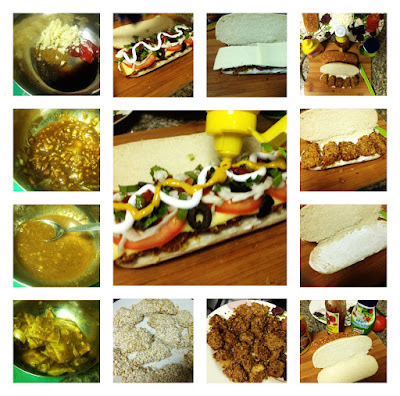 But the assembling of ingredients makes difference in the taste of the sandwich. So let's see how to make a restaurant-style simple cheesy chicken sub sandwich. Cut the chicken breast into thin slices and then cut into cubes of medium sized. ( I used the marinated and cooked chicken breast with turmeric powder, salt and then chilled). Else you can cook it with turmeric powder and salt and then marinate with the above ingredients given under marination. For that mix all the ingredients in a bowl and then grind to a fine paste and then marinate. After 10 minutes, coat each piece of chicken with oats well and press gently to stick oats on the chicken pieces. Deep fry it in batches and set aside. Spread 1 tbsp of mayonnaise evenly, top it with fried chicken pieces, then with cheese slice. Now the next step is very important. Melting the cheese before assembling veggies are best in taste. So melt the cheese in oven for 2 minutes or until melts. Take out the sandwich, layer it with a tomato slice, then with cabbage, olives, and veggies of your choice and finally top it with 2 tsp tomato sauce, 2 tsp mayonnaise, 2 tsp mustard cream. 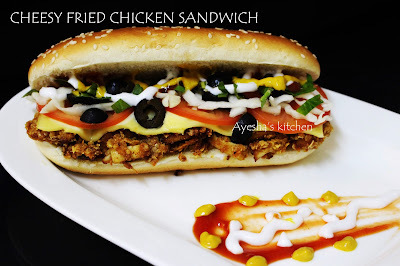 Our yummy chicken sandwich is ready to eat. Serve along with french fries and Pepsi / fresh juice/ fruit cocktail.